On Thursday, the US State Department, in the person of Secretary of State Pompeo & Melania Trump, was handing out human rights awards to women honorees who should’ve had the good sense to reject them. If you’re committed to human rights, you don’t accept honorifics from an institution steeped in the blood of millions. On Friday, the State Department, in the person of Pompeo, announced it will revoke or deny visas to members of the International Criminal Court (ICC) coming to the US to investigate war crimes & torture of detainees in Afghanistan by US forces, private contractors, & the CIA. The ICC does not have cooperation from the Afghan government in its investigation since successive regimes have been coerced by the US into a security agreement granting the Pentagon impunity from prosecution for war crimes. It’s a similar agreement to India’s Armed Forces Special Powers Act giving impunity to Indian forces for war crimes in Kashmir & within its own borders. The US Pentagon has always acted on the principle of impunity for its war crimes. On the 51st anniversary of the My Lai massacre in Vietnam there is still no justice for the victims. These security agreements with Afghanistan & Iraq are primarily to protect the Pentagon from prosecution in a civilian court of law. The ICC investigation has been going on for at least two years even though the war in Afghanistan has gone on for nearly 18 years. The ICC chief prosecutor Fatou Bensouda reported last year that the war crimes were not abuses by a few isolated soldiers but were systemic to the US occupation, especially in the use of CIA torture techniques. Anyone who has closely followed the war in Afghanistan knows that war crimes against Afghans go way beyond even the most unspeakable torture. 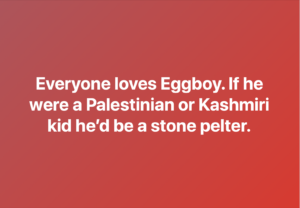 They’ve included bombing overcrowded prisons, stuffing prisoners into containers without air holes or water & carting them long distances in summer heat where they arrived to their destination dead & were dumped in mass graves. After Abu Ghraib & Guantanamo we know what they’re doing to Afghans at the Parwan prison hellhole near the Bagram air base. We know about their carpet bombing, including the Mother of All Bombs in April 2017. We know about the refugee crises, the internally displaced, the homeless, the child workers, the thousands, especially small children, disabled by landmines. What the Pentagon doesn’t want us to know about is the near-industrial scale of its war crimes against the Afghan people. 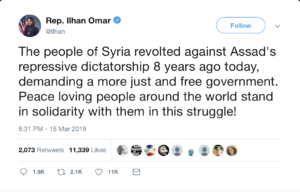 The greatest tragedy of all is that the antiwar movement is so obsessed & compromised by defending Assad, Maduro, & now even the Iranian government that it hasn’t been able to mobilize in defense of the Afghan, Syrian, Iraqi, Yemeni, Somalian, & Libyan people. There is no war coverage in Afghanistan. The only photos are those which glorify the US army & the only reporters are the embedded kind who are always propagandists. This ICC investigation is not a substitute for antiwar opposition but it can be drawn on to rebuild the antiwar movement on a principled basis. This is six-year-old Laiba Hazrat, an Afghan refugee in Pakistan. 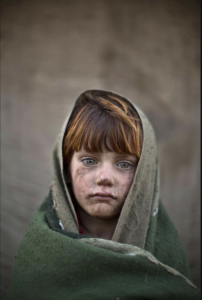 Because there is no independent war reporting from Afghanistan, let this small girl represent the millions of Afghans who have suffered the unendurable but have not been defeated by one of the most sophisticated & ruthless armies in the world. US out of Afghanistan now! Ilhan Omar speaks for the Muslim, Arab, & Somali communities in the US. The inability to build antiwar actions broader than Lilliputian & Stalinist political sects is because of the antiwar movement’s betrayal of antiwar principles & capitulation to ‘war on terror’ rhetoric. A principled antiwar movement will be rebuilt on opposition to all war, on solidarity with Muslims & a rejection of Islamophobia, & a commitment to working people, not corrupt regimes. 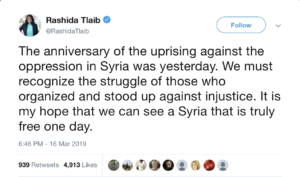 Palestinian congresswoman Rashida Tlaib on Twitter expressing her support, as did Ilhan Omar, with the Syrian Arab Spring uprising. Assadists are all over them on Twitter but they represent the voices of the Arab community in the US. An uncompromising antiwar movement must be rebuilt to replace the one limping into oblivion for obsessing with “regime change operations” & promoting bombing as liberation rather than opposing all foreign military intervention & the bombing of civilians. Thank you, Rashida Tlaib for speaking the truth. Guernica: Picasso’s depiction of the 1937 Nazi German bombing of the Basque town of Guernica during the Spanish Civil War. 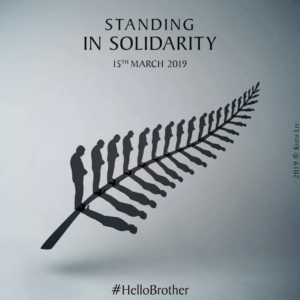 Such horrors & savageries have become the gestalt of our times, directly linked in a historic continuum to WWI & WWI which were not fought about democracy or against fascism but about US & European competition over colonialism plunder. Every single war, occupation, genocide today is tied to that festering legacy. The historic mission of our generations is to confront that legacy–being fought on the front lines by Palestinians, Kashmiris, Syrians, Iraqis, Somalians, Yemenis, Rohingya, Libyans, Blacks, & so many other oppressed peoples–& end decisively, once & for all, the white supremacy, violence, & militarism that are the essence of that legacy.